Temperature mapping – an introduction. “An initial temperature mapping exercise should be carried out on the storage area before use, under representative conditions. Temperature monitoring equipment should be located according to the results of the mapping exercise, ensuring that monitoring devices are positioned in the areas that experience the extremes of fluctuations. The mapping exercise should be repeated according to the results of a risk assessment exercise or whenever significant modifications are made to the facility or the temperature controlling equipment. For small premises of a few square meters which are at room temperature, an assessment of potential risks (e.g. heaters) should be conducted and temperature monitors placed accordingly”. It has become apparent during inspections that some companies are unclear as to what is expected of them to comply with this requirement in the GDP Guidelines. This seems particularly apparent with new applicants and those companies with small storage areas, possibly a few shelves or small refrigerators, to which this blog is particularly aimed. Some larger storage areas may employ the expertise of a third party company specialising in this area. Guidelines say that mapping should take place, but it does not state how this should be done. To demonstrate by way of documented evidence that the chosen storage area is suitable for the storage of temperature sensitive medicinal products. As stated in one of my previous blogs, ambient products are also temperature sensitive. A mapping exercise of the proposed storage area will ensure that the company will understand their storage area and identify any potential areas therein that may be unsuitable to store medicines. A mapping exercise will also inform as to where permanent thermometers should be located. If possible, before stock is stored. This might not be possible where a storage area is being reconfigured. In smaller empty storage areas, dummy products could be used to simulate normal operational storage without compromising genuine product, including cold stores and fridges/freezers. In an empty storage area, a mapping exercise should be repeated when fully stocked. Data arising from the exercise should be documented and a risk assessment documented with any hot or cold spots identified. This exercise should then be repeated to take into account seasonal variations. Firstly, look at the area to be used for storage, identify the highest point of storage not the highest shelf or pallet location. Identify any potential problem areas such as heaters, lighting, windows and doors, loading bays or high storage areas such as mezzanine floors. These areas should be covered in the exercise. Don’t forget to include areas such as CD rooms, packing areas, Returns and quarantine. When deciding on a storage area, remember, it can be difficult to cool storage areas down as well as heat them up. Use calibrated monitoring probes in sufficient numbers dependant on the size of the storage area. Once the initial mapping exercise is complete, the data should be recorded and risk assessed to determine the most appropriate positions for the permanent monitoring probes and should cover the areas that have the widest temperature fluctuations or indicate areas with any hot or cold spots. Repeat the exercise to cover seasonal variations or if the storage area is subsequently reconfigured. A risk assessment would also define and justify the regularity of any future mapping exercises and must also be regularly reviewed, perhaps as part of the self-audit process. The RP should be party to the whole mapping process and should be fully aware of the mapping exercise findings, risk assessment recommendations and review process. The RP involvement does not stop at the mapping process however. The RP should also be able to demonstrate supervision and review of subsequent daily minimum/maximum routine temperature monitoring and recording and should be consulted in the event of any temperature excursions. thanks you for this information. i would like to know how long does one perform such a mapping exercise... ie over 2 days/10days/ 30 days/ a year? The company would need to decide and be able to justify the length of the mapping exercise by way of a risk assessment of the storage area concerned. Seasonal variations must also be taken into account. “Once the initial mapping exercise is complete, the data should be recorded and risk assessed to determine the most appropriate positions for the permanent monitoring probes and should cover the areas that have the widest temperature fluctuations or indicate areas with any hot or cold spots. A risk assessment would also define and justify the regularity of any future mapping exercises and must also be regularly reviewed, perhaps as part of the self-audit process”. First, great blog and really helpful for the smaller wholesalers. Thank you Mr Todd. Secondly, Hi Riad, usually a week (7 full days) is a decent time. Now is a good time as we are coming into peak temperature (hopefully!). Mapping Jan/Feb and Jul/Aug, with remap if any structural changes, major maintenance/part changes/relocations in fridges/walk-ins or stock rooms. Thereafter every 2-3 years, or again if there are changes. 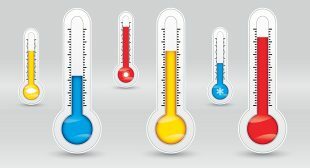 I am not fond of thermometers, and much prefer a permanent monitoring system that shows a temperature trace and has alarms if temperatures deviate outside of the set ranges. This will show any excursions of temperature and give a genuine timeline of what happened and when and for how long. Invaluable when assessing stock after a deviation. These systems can be pricey but there are some reasonable solutions out there. Don't forget to stress test by opening and closing doors, turning air-con on full heat or cold or leaving heaters on overnight, ensuring times are documented and see what extremes are reached. This is best with no goods or empty packs. Turning fridges off to see how long before it goes above 8 is also potentially useful. The recording of temperatures during the thermal mapping of a warehouse or cold room should be sufficient in time frame to capture workflow variation that may impact air flow and the resulting temperature fluctuation (i.e., a period of one week is recommended for data collection and capture workflow cycles). Thanks for highlighting the practical aspects of a key GDP principle. Companies and company owner storage premises are featured in the text. What is MHRA stance on investigator's site premises for storage of study drugs ? It is not always possible to have the local pharmacy involved, as well as these site located storage areas are, I believe, either similar or smaller than the described "small storage areas, possibly a few shelves or small refrigerators, to which this blog is particularly aimed". The most problematic part is that even if companies are willing and aiming at temperatire mapping at their own premises, this is beyond our control at the sites. Shipment and storage of IMP is an essential part of any clinical trial, as it is imperative that the product has been stored correctly at all times to maintain its integrity. It is recommended that sponsors perform a risk assessment to determine the storage requirements (for example, temperature, humidity and protection from light) and what type and level of monitoring is required when shipping IMPs to investigator sites. There is no legal requirement for the frequency and method of temperature monitoring; however, it is recommended that this is determined and documented in the risk assessment. A robust system should be in place to ensure appropriate storage of the product prior to dispensing to a subject, and that there is evidence to support this. Further guidance on this subject is available in Chapters 6.14 and Chapter 11 of MHRA’s Good Clinical Practice Guide. Longest storage of material would be ideal time to consider for mapping. Seasonal mapping may not be required because the intent of the mapping is to find out the distribution of temperature across the storage warehouse and to establish the "COLDEST" spot and the "HOTTEST" spot. Seasonal mapping allows establishment of the hottest and coldest points throughout the year as these may change - for example use of heaters in the winter, skylights and sun position etc. Seasonal mapping will provide you with a full understanding of the thermal footprint of your facility whatever the time of year. Appreciate your recommendations on temperature mapping studies of clean rooms (processing areas such as sifting, granulation, blending, compression, coating, packing etc.) as part of facility and HVAC qualification. Routinely the normal expectation would be for temperature monitoring only within production areas. However, temperature mapping may be required if the product is temperature sensitive and additional control measures are used in production. This would need be done on a risk based approach giving additional consideration to the exposure time within each processing step. Thank you and good information. I have question on humidity. Mapping should cover humidity contol? There are no stated humidity limits on UK packs and therefore no requirement within EU GDP for humidity to be included in mapping and monitoring exercises. However, using a quality risk management approach if your storage area presents a challenging environment you may wish to add humidity monitoring within your programme. Fortunately we have a temperate climate in the UK and Europe and humidity is not an issue. However, as mentioned above a risk based approach should be used when assessing the storage area. For example, if the storage area was located in a basement. Humidity in such enclosed areas is commonly caused by moisture migrating through a concrete foundation and condensing on the cold concrete walls and floors. In other regions around the world e.g. Iran and Egypt where the climate is hot and humid or Brazil and Singapore where it is hot and very humid with a relative humidity of 75% this can be issue. Temperature loggers which also measure RH are easily available if required. An interesting example..... Whilst the basement storage situation does provide an example of using a quality risk management (QRM) approach, it should not be used to justify bad practice. It could usefully be implemented to highlight any potential changes in the building fabric and give an early warning of a coming issue in a basement with suitable construction and damp proofing (supplementing routine checks of the building fabric during self inspection). However, if a basement area did have moisture migrating through concrete foundations and condensing on the cold concrete walls and floors then this is an unacceptable storage area, full stop, and no QRM approach will change that! we are in climatic zone IV. There is temperature mapping study of storage area is gong on. Relative humidity (for low RH area) measurement is impactful on study or not? Please refer to EU GMP Chapter 3, 3.19 Where special storage conditions are required (e.g. temperature and humidity) these should be provided checked and monitored. In order to carry out an effective monitoring a mapping study should be carried out to define placement of monitoring probes and to assess whether the storage area is appropriate for the storage of the product. I think this blog is very good in providing more clarification and elaborating on the content of the green guide with regards to temperature control. Are there any plans for a blog on qualification of equipment for storing TTSPP's in a warehouse facility? Thanks Nick - A good suggestion and one we have now added to our list for the future. Humidity control can become very useful and in some cases necessary when product is routinely shipped by seafreight container. The cardboard packaging and timber pallets absorb large amounts of moisture under "normal" humidities. This moisture can lead to mould growth and/or condensation rain as the container traverses the globe through changing climates. Mouldy packaging usually means total loss of product! The shipping lane risk assessments, ideally carried out by your logistics partner, should show appropriate controls - either type / amount of desiccant or the need for fully humidity controlled container. Both these have a cost impact, so significant savings combined with a reduction of quality risk are possible through storage area humidity control and starting off with a "dry" cargo. Humidity mapping is desirable, therefore, to support the outcomes / decisions of the shipping lane risk assessment. How many data loggers ? I've been told every 5 to 10 meters? what about the racks? Firstly, look at the area to be used for storage, identify the highest point of storage - not necessarily the highest shelf or pallet location. Is there any guidance regarding when a vehicle (truck) should be temperature mapped based on time of a journey. For example if a collection/delivery of a pharma product is done, in a temperature control vehicle, and that journey is expected to always be 1 hr, would there be an expectation on the haulage provider to temperature map the vehicle? If distribution is contracted by a wholesaler (contact giver), to a third party (contract acceptor), the contract giver is responsible for assessing the competence of the contract acceptor to carry out the work required. An audit should be performed before engaging the contract acceptor who should have adequate premises and equipment, knowledge and experience and competent personnel to carry out the required tasks. The products being transported remain the responsibility of the contract giver and a risk assessment should be conducted to ensure that deliveries are not exposed to conditions that could affect product quality and are in accordance with the label requirements. Time will clearly feature as one aspect of that risk assessment. Therefore, it is not a straightforward yes or no answer and depends on the individual situation - hence the risk based approach. Additional information is covered in GDP Guidelines Chapter 7 on Outsourced Activities and Chapter 9 on Transportation. Hi... Late reading of this interesting thread. I had a question regarding loaded mapping (when you talk about "dummy products". If a freezer unit is routinely used to store products in cardboxes. Do we agree that loaded mapping should involve dummy cardboxes filled with any sense enough content, or mappng with empty cardboxes are acceptable? I guess it's a question between the effect of air cirulation and the effect of heat capacity of the freezer's content? The objective of the loaded temperature mapping test for a freezer is to demonstrate that it is capable of controlling and maintaining a uniform temperature when in use. To ensure the test replicates the intended use, a simulated load should be representative of what is intended to be stored. So, empty boxes are not appropriate for small volume refrigerators and freezers. Is there any guidance or requirements for temperature mapping of processing areas in pharmaceuticals, other than monitoring from fixed routine monitoring sensors. The way we do for warehouses and storage areas. EU GMP Chapter 3, 3.1 states that: Production area should be effectively ventilated with air control facilities (including temperature and where necessary humidity and filtration) appropriate to both the products handled, to the operations taking place within them and to the external environment. Annex 15 Principle states that: As part of the quality risk management system decisions on the scope and extent of the qualification and validation should be based on a justification and documented risk assessment of the facilities, equipment, utilities and processes. You should therefore apply risk management principles in this determination. How many temperature / Humidity sensor are required for daily monitoring / recording in stability walk in chambers ? There is no specific guidance on this, however it should be defined based on mapping studies, equipment capabilities and the capacity of the chamber. All decisions should be scientifically and technically justified. Placement of probes should be in areas of widest fluctuation, hot and cold spots. Risk assessment should be used in determining decision. First, I would like to thank You for a very interesting and useful blog and use this opportunity to have Your opinion on mapping frequency. Our routine mapping frequency for laboratory freezers, refridgerators, stability chambers, etc. is once annually. We are currently trying to implement mapping frequency of 2-3 years for every NEW piece of CTUs we obtain and perform complete IQ, OQ, PQ procedure. However, during time interval of 2-3 years between each remapping, we plan to check and document accuracy of control thermometer against calibrated referenced thermometer every year. I would like to hear Your thoughts on this idea. Dear Vedran, As detailed in the blog, the expectation is that a risk assessment is in place to support your determined frequency of temperature mapping. The general expectation is that equipment should be calibrated annually as you are intending to do.